To address problems with reading, we provide the Davis Dyslexia Correction® program, which consists of two main components, Orientation Counseling and Symbol Mastery. The Davis Dyslexia Correction® program always includes both of these components. Davis Orientation Counseling® teaches students with learnig disabilities how to recognize and control their learning disability. Through a simple technique, the students learn to “turn off” what is causing their learning problems. Once Orientation is learned, they are then able to “focus”. The student is then ready to build the skills that will allow them to overcome problems stemming from their learning disabilities. Davis Symbol Mastery® gives students the ability to think with symbols and words, so they can learn to read easily and with full comprehension. The student uses clay to model trigger words - the short abstract words, frequently encountered in reading, such as and, the, to, or it. These words cause problems when children with learning disabilities cannot form a mental picture of them. Through Symbol Mastery, the student makes a three-dimensional clay model of the meaning of each word, together with a model of the letters of the words. With this approach, learning is permanent. 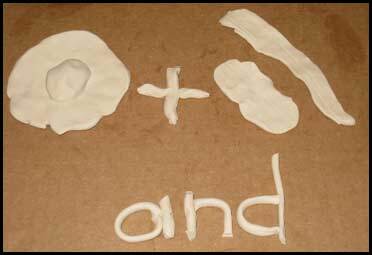 We use clay to make a picture of the definition of those pictureless words that cause confusion. Once the model is mastered (via Davis Symbol Mastery®) that word no longer causes confusion and mistakes. The picture on this page is a model a client made of the word “and” meaning "also; as well as". As you can see, she created eggs and bacon to remind her of the meaning - eggs as well as bacon. Before her program, the word "and" caused her to lose her place while she was reading or turned into "the" in her mind causing mistakes of reading and comprehension. Neither of these things happen to her anymore. One of the many other skills which are learned is three steps of easy reading. The Davis reading program does not use phonics, drill, or repetition (which doesn’t work well for learning disabilities). Instead, we teach three powerful reading exercises that use the childs innate picture thinking ability to their advantage. The client quickly improves competence, confidence, and comprehension.